Freechoice: Visit the History Museum and Hoa Lo Prison, or partake in an authentic cooking class. Alternatively visit Ho Chi Minh Quarter and Mausoleum, including a visit to the Temple of Literature. 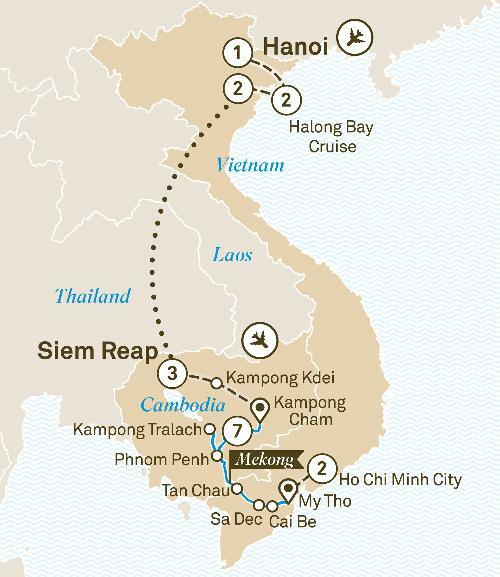 From Hanoi to Ho Chi Minh City, discover the highlights of Vietnam & Cambodia. Experience the wonders of Halong Bay, Phnom Penh & the incredible Angkor Wat.